Very often, the text you choose from the Public Domain will need edited or organized. There are a number of reasons for this, including. Irrelevant Sections of Text. 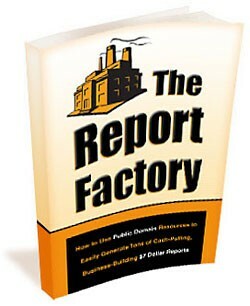 There are often sentences or paragraphs in the text that do not support the primary message of your report. Omitting these will help to focus and streamline your message. Multiple Sources of Information. If your information comes from multiple sources, you may have competing or overlapping information that should be deleted as necessary. Outdated Language. When using classic texts from the Public Domain, you will find that the language is outdated or unclear. This can often be remedied with some quick word substitutions. If you are unsure of the meaning of a word, look it up. Don’t assume you know…you could be wrong and embarrass yourself. While you may choose to do this process yourself (especially if the needed corrections are minimal), do not rule out hiring a ghost writer or editor to help you.